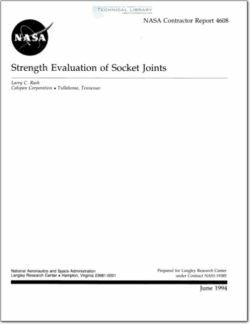 strength of a unit width of the joint. NASA LaRC sting joints, and the joint members are in full contact fore and aft of this midsection gap. rigid, parallel beams that are joined by an infinite number of springs along the contacting surfaces. type joints found in model support systems in NASA LaRC wind tunnels. tapered, socket type joint is included as Appendix A.